(BELOIT, WI) April 5, 2019—Corporate Contractor Inc.’s work on the Stateline Family YMCA project in Beloit, WI has earned a National Excellence in Construction® Pyramid Award from Associated Builders and Contractors in the General Contractor > Renovation – $10 to $100 million category. 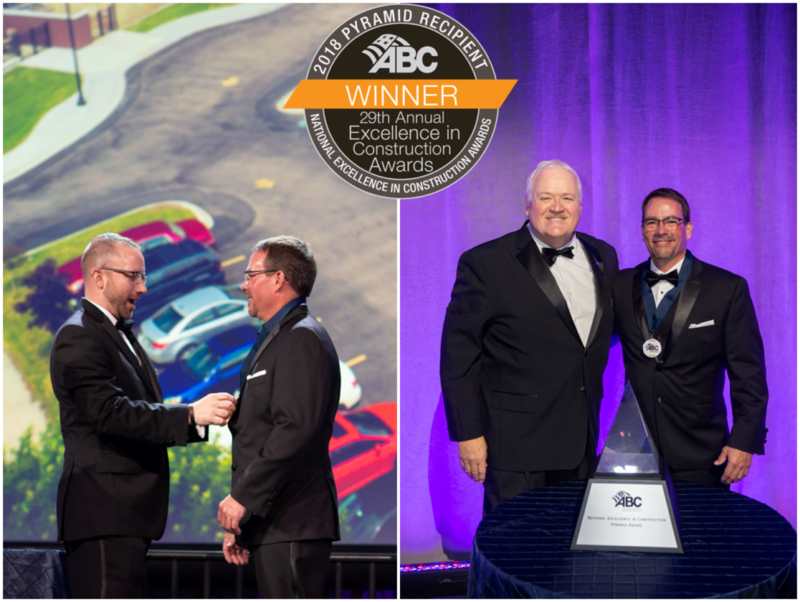 A representative from the company received the award March 27 during ABC’s 29th annual Excellence in Construction® Awards gala at ABC Convention 2019 in Long Beach, California. The CCI build-team successfully completed a challenging renovation of an 80,000 square foot former manufacturing site into a one-of-a-kind YMCA athletic facility. With its methodically preserved industrial character, the center features an indoor water park with three pool areas and whirlpool, childcare facilities, basketball court, racket ball courts, three locker rooms, exercise rooms, a second-floor rubber running track, multi-purpose rooms, fitness center, weight room, wellness center, and administrative office areas. There was not an area that remained untouched by the extensive transformation. The Excellence in Construction awards program is the industry’s leading competition that honors both general and specialty contractors for innovative and high-quality merit shop construction projects. The award honors all construction team members, including the contractor, owner, architect, and engineer. The winning projects, selected from entries submitted from across the nation, were judged on complexity, attractiveness, unique challenges, completion time, workmanship, innovation, safety, and cost. Corporate Contractors Inc. is a leading general contracting firm headquartered in Beloit, Wisconsin with additional offices in Delafield and Williams Bay. The company provides construction solutions to multiple markets both locally and throughout the United States. In addition, they offer limestone aggregate materials at their two quarry locations. CCI is part of the Hendricks Holding Company Inc. portfolio of companies and is owned by Diane Hendricks. Visit www.cciwi.com for further information. Associated Builders and Contractors (ABC) is a national construction industry trade association established in 1950 that represents more than 21,000 members. Founded on the merit shop philosophy, ABC and its 70 chapters help members develop people, win work and deliver that work safely, ethically and profitably for the betterment of the communities in which ABC and its members work. Visit them at www.abcwi.org.